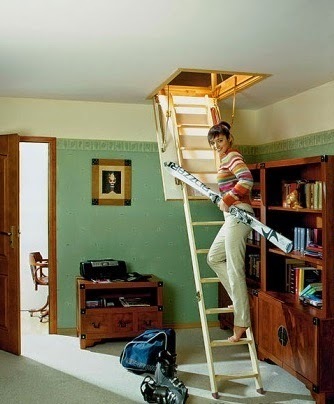 Most often in country houses (dachas), there is no place for the construction of large staircase leading to an attic or loft.Step Ladder - is not safe. Besides, she is ugly and not very comfortable,we use the loft constantly.Problem can be easily solved using the attic stairs.When folded, it is completely invisible - just a hatch in the ceiling. 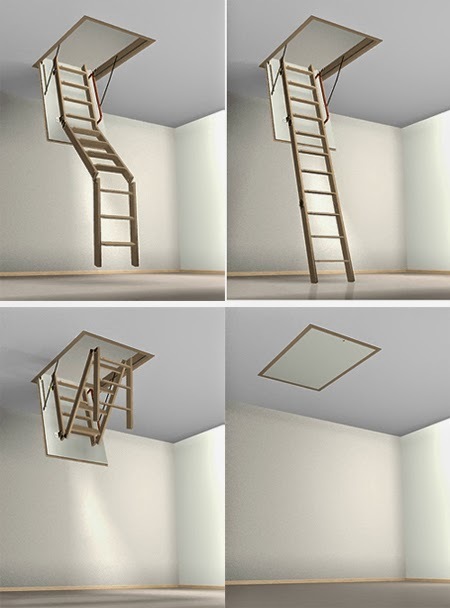 However, if a special pull rod, the floor-to-ceiling windows stretch convenient chain steel or wooden stairs.Depending on the model you can pick up the stairs to a height of 2.7 to 3.2 meters, or may not have handrails.But any attic stairs to withstand the weight of a large adult - up to 160 kilograms. Attic stairs made of pine and consists of three sections.It allows you to safely and easily climb into the attic or loft. Does not spoil the interior staircase, as after installation is stored "in the ceiling." Cover does not require additional finishing, it looks quite aesthetically pleasing.With a special design saves space stairs.She herself is characterized by durability, functionality, ease of installation and ease of use and safety. Manhole cover is a 36-millimeter frame, lined on both sides white fiberboard. The space between the plates is filled with foam or other insulation material.On the outside are not visible fittings - it is completely smooth. Using a metal rod and lock the cover is securely locked.the design of the stairs was designed so that its elements are quite difficult climb to the attic or loft.Reinforcement ladder corner profiles contribute to a precise installation. ladder stability is guaranteed by its unique design. To increase the strength of the joints, stair steps for fixing system used "dovetail".With lid stairs steps are not touching, and security usability provide recess, non-slip. attic stairs during installation based on the additional board. They should be temporarily attached to the bottom of the opening. 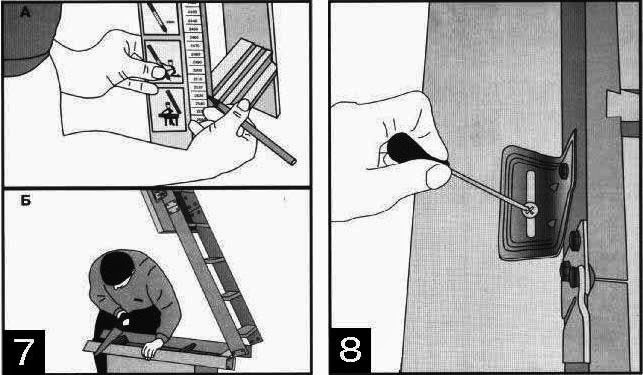 installation is carried out by two persons.first before you install the attic stairs collect all the necessary tools (10 mm flat wrench, a screwdriver, a protractor, screws, table ).After this there is retracted attic stairs, and then laid on the auxiliary board, arranged in advance.Between the edges of the opening and ladder box screwing screws in places you want to insert a spacer, keeping the boxes in the corners of the stair angles, as shown in Fig 3 . Attention! You can not use the stairs until the full completion of installation. The remaining top after folding stairs installer fixes two screws (minimum) each of the side portions of ladder box (Fig. 5) After that, the gap between the edges of the stair opening boxes and it should fit fill insulation material. Bolts side element (Fig. 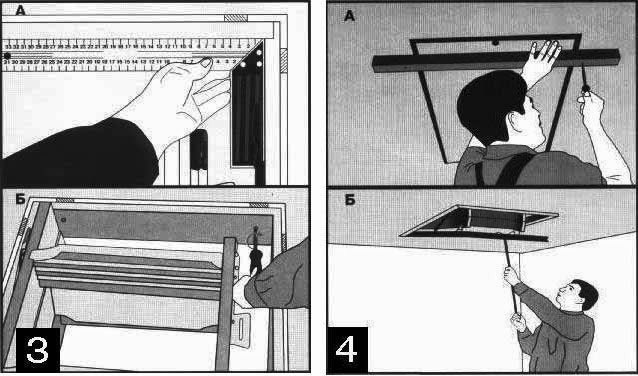 6a) is impaired, then throws a ladder from the cover until it stops (Fig. 6b). Thereafter, the bolts should be tightened. 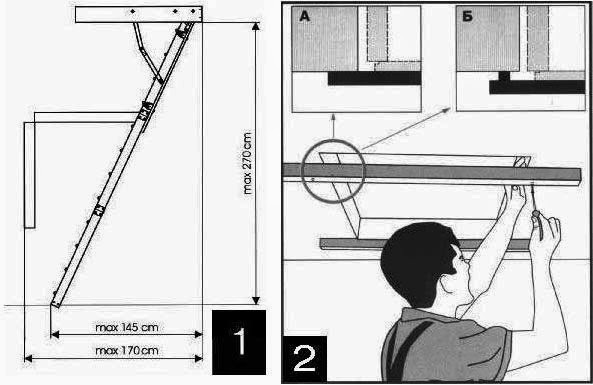 In order to align the height of the room and the length of the ladder, you need to cut off a portion of the lower member with the expectation that all elements after folding stairs form a straight line to do this, the mounting location of stairs measure the height of the room, and then outline the position of the line sipped using a template according to the instructions on it (Fig. 7a). Then on the designated line sawn lower element (Fig. 7b). If the line falls sipped a notch, then you need to apply at the side corners of the adjuster (Fig. 8). 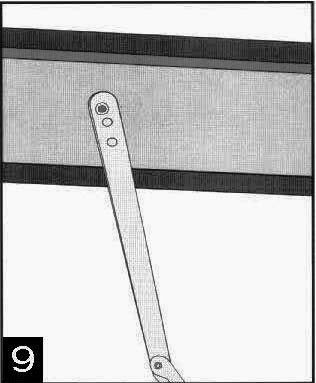 To do this, loosen the screws that secure the corners. After that ladder must be moved so that the line accounted sipped by step. You can use the stairs to adjust the location of the side corners, if it's lower section sawn inaccurate. 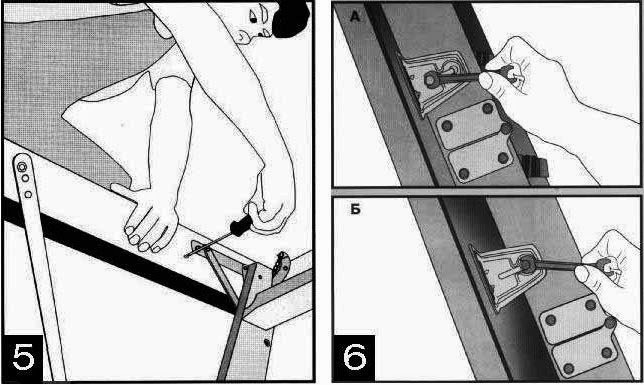 To do this, the locking screws must be loosened corners, and then move up or down the stairs so that all sections of it lined up in a straight line, and the lower element came in due place. Sometimes adjust the angle of the stairs you can change the location using the mounting side support, rather, intended to fasten the holes (Fig. 9).